Whenever I hear the term “family style”, I hear a little voice in my head that says “don’t eat all day…it will be worth it”. Whether or not I actually listen to said voice is a different story. In this case, I should have listened. 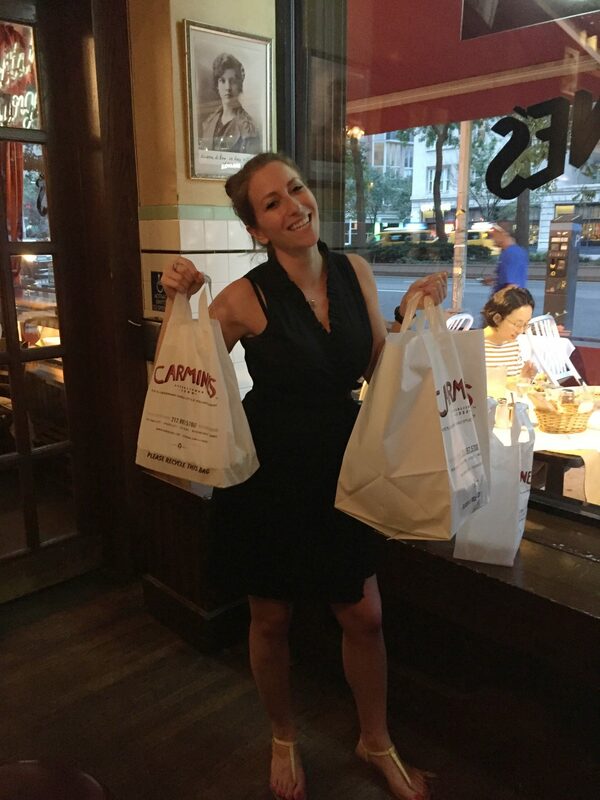 Carmine’s opened it’s first location on the Upper West Side in 1990; in it’s simplest form, it’s a family style Italian restaurant. Once you step inside though, you would think it’s been there since 1946, if not earlier. 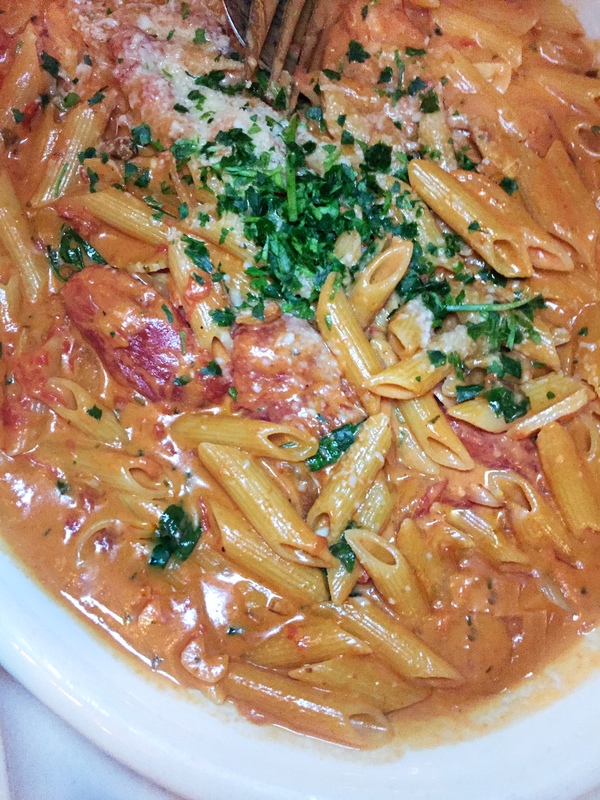 Channeling the ambiance of the Golden Age with the hospitality of the Italian grandmother I never had, I found Carmine’s to be just perfect. The portions were MASSIVE (again, family style) and we left drunk, full to the point of exhaustion, and happy. Was it pricey? Yes, but at the same time, you’re getting so much food, it’s not that outrageous. One entree feeds four people. Four savage, beastly people. I left with catering size trays of leftovers. Not kidding. I’ve had many a hot antipasto plate in my day, but this one was like a giant pu pu platter of meat and cheese deliciousness. 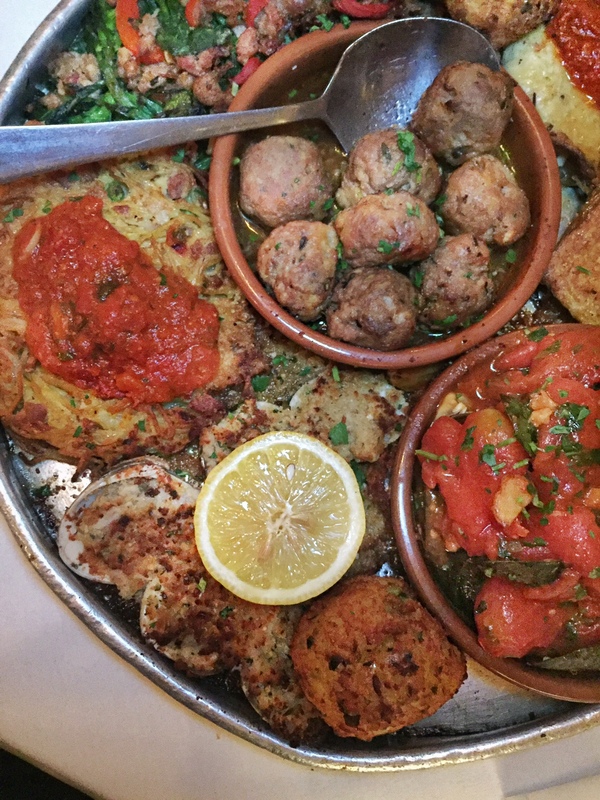 Sausage and broccoli rabe, mussels, meatballs, arancini, baked clams, eggplant rolatini, and mozzarella in carozza (fried mozz). The arancini, eggplant, and sausage/broccoli rabe were my favorites. Normally mozzarella in carozza is my jam, but this one may have been cooked on the same flat top or in the same oil as some shrimp because it had a fishy taste. Kind of upsetting, but the rest made up for it. Who orders a side of meatballs as an appetizer?? WE DO. And wow, what a good call. 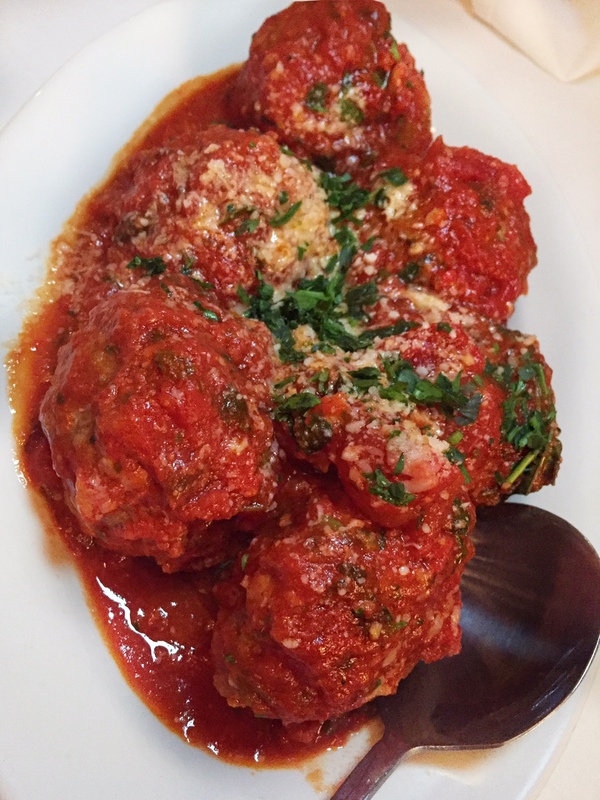 These might be some of the best meatballs I’ve had in a long time. Perfect texture and balance of flavors – not too mushy, and just the right amount of sweet marinara sauce and basil on top. I sprinkled mine with more parmesan cheese because I’m a cheese beast. I’m a sucker for pasta. And I’m an even bigger sucker for penne a la vodka. This is their best selling pasta, and I can see why. The sauce had great flavor; a little heavier on the tomato and onion accents, which I actually liked a lot. Sometimes penne a la vodka can get very bland and drowned in cream, but that was definitely not the case here. Just great all around. As stated above, this was a special for the evening, and if I’m being honest, I’m not sure why it’s not on the regular menu. 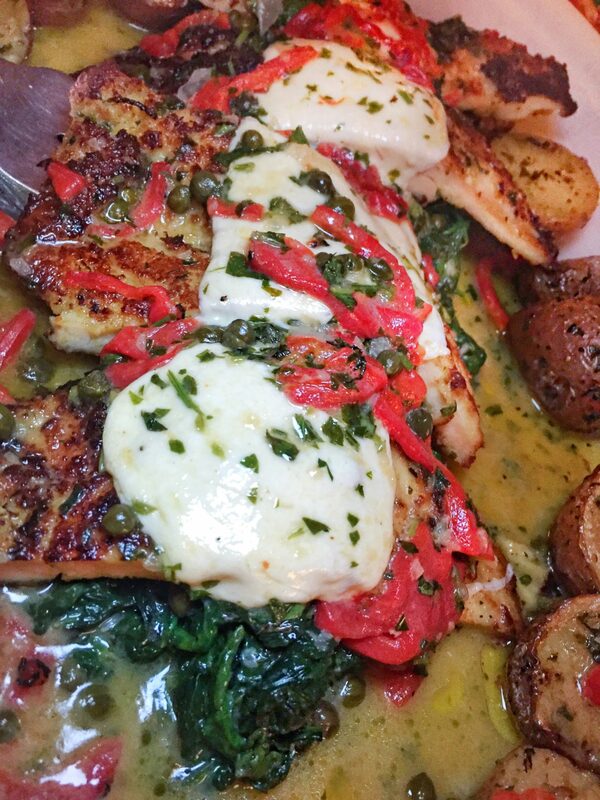 It was delicious and a favorite of the entire lineup: chicken cutlet with mozzarella on top, served over a bed of lemony, buttery, spinach and potatoes. When I say this was served on a platter the size of a small canoe, I’m only slightly exaggerating. Shrimp in spicy tomato sauce. Plain and simple, and always one of my favorites. Well, it was definitely my friend Matt’s favorite. I think he may have eaten this one all by himself. Half at the table, and half on his way home in a cab after the three of us polished off our 4th bottle of rose. We’re savages and we’re proud. Here I am with my leftovers. Each one weighed about 10 lbs.